Want Your Limit of Redfish, New Orleans is the Place! Looking to catch Redfish, New Orleans is the place to be! Get ready, Get Set for some heart pounding, cooler filling action only the marshlands of Delacroix Louisiana have to offer! We’ll set you up, take you out and let the drag scream as you have the fishing fight of a lifetime. Redfishing at its finest. These fish refuse to give up and will provide you the ultimate challenge all the way to the icebox. The inland marshes and coastal waterway’s of Louisiana are a must see stop in your New Orleans vacation. The finest fishing and good ole southern hospitality. Come experience the adventure with Louisiana Fishing Charters. Redfish (Red Drum), are also commonly referred to as channel bass, spot tail, red bass or reds. Feeding on a combination of crab, shrimp and minnows these fish know how to put up a fight. You’ll know when you hook up with one these guys as the drag will start screaming, and the fight is on. Welcome to the Redfish Capital of Louisiana, Welcome to Delacroix! If the redfish was a player on a football team it would be play the position of linebacker because they move with such strength and purpose in a calculated and aggressive manner. We love to put our clients on schools of relish and watch their faces light up as they a battle toe to toe with these brutish bulls of the Louisiana marsh. If you’re looking for a redfish guide Louisiana is the place to come and we can take you right to the action. Beyond the sporting fun of these fish, they are also very pleasant table fare. When you fish with us, we can recommend the best ways to cook redfish and will gladly package your fresh fish fillets to take home with you. If you are traveling to New Orleans red fishing is not far away. Our dock is located approximately 45 minutes from downtown New Orleans and the world famous French Quarter. 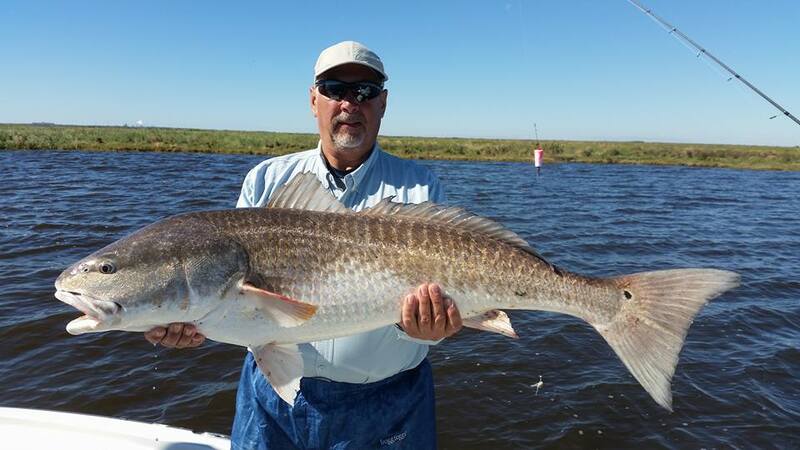 There is really no “best” season to come red fishing at Louisiana Fishing Charters. Redfish feed actively year round and we are able to track them as they move through seasonal patterns. If you’ve never experience insane redfish action or if you’ve had it already and just can’t get enough, come on a Louisiana charter fishing trip with us and we’ll show you exactly what we’re talking about.